Marriott International (NASDAQ: MAR) today announced its transformation vision for Sheraton Hotels and Resorts, the third largest brand in its portfolio, and the largest outside of North America in terms of room count. The company, which introduced its new Sheraton guestroom late last year, is showcasing its vision for Sheraton's public spaces at the NYU International Hospitality Industry Investment Conference in New York, bringing to life for owners and investors the company's brand strategy as well as its signature focus on guest experience, hotel operations and design philosophy. "From the moment we closed the Starwood merger in late 2016, the revitalization of Sheraton has been a top priority for our company," said Arne Sorenson, President and CEO of Marriott International. "We knew that the way to restore this incredible brand was focus and collaboration with our hotel owners. We wanted to build on Sheraton's rich legacy of sitting at the heart of communities across the globe, but also to create a differentiated positioning and compelling proposition for our owners. With our Sheraton transformation plan, we've put together all of the pieces of the equation to work cooperatively with our owners to set this iconic brand on a new, disciplined and successful path. We are ready, our vision is clear and the energy is robust for Sheraton." This week, Sheraton has built out a 4,200-square-foot vignette at the NYU International Hospitality Industry Investment Conference that brings its vision to life, allowing investors to understand and experience Sheraton's transformation plans firsthand, particularly the concepts for the hotel's public spaces. 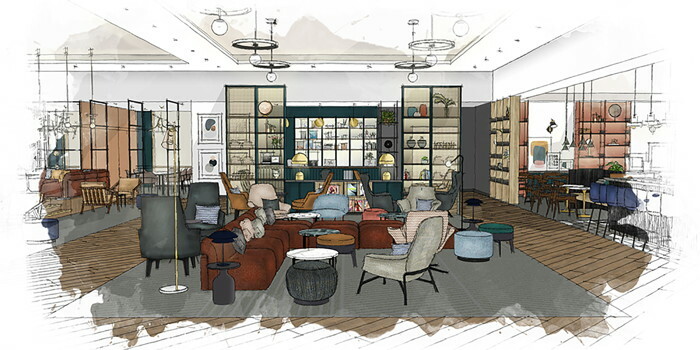 Reverting to its roots as the gathering place for locals and guests, Sheraton today amplifies that legacy by leaning into services and design that enable socialization, productivity, and personalization. Its strategy features collaborative venues, technology enabled designs, and a host who helps deliver a unique experience that is exclusive to Sheraton. "Marriott International is well positioned to deliver a comprehensive strategy for Sheraton's brand transformation and we already have great momentum. This is the first time in years that the brand has been above competitive benchmark in both rate and occupancy," said Tina Edmundson, Global Brand Officer, Marriott International. "We have improved brand standards, increased group bookings, and have ramped up our business engine over the last year as a first step in a multi-phase, multi-year plan, leveraging our experience in revitalizing lodging brands." The company undertook a repositioning of the Marriott Hotels brand beginning in 2013, redesigning the guest room and MClub Lounge working in close cooperation with Marriott Hotel owners. The work has resonated with guests and owners alike. Renovated Marriott Hotels have seen market share gains of, on average, nine percent and "intent to recommend" scores from customers that are eight points on average higher than non-renovated hotels.